‘October’ claims to be a story of ‘love’ and not exactly a ‘love story’. True; but, in the present day young generation milieu such odd characters like Dan cannot be just dismissed. A happy, whimsical, carefree, fiesty young man Dan (Varun Dhawan) changes his life all of a sudden with an unexpected accident of his fellow intern Shiuli (Banita Sandhu). Both are students of Hotel Management and placed as interns with a few others in Raddison Blu Dwaraka at New Delhi. If the accident and her comatose drawn him close to her in a weird manner, a vague question she she asked about him before her fall which he comes to know from his friends draws him still closer. In fact, in earlier occasions they never even had any conversations. He wants her to come out of her dormant state and tell him why she asked about him. Is it his curiosity, fancy, obsession or love? In the bargain he earns bad name in the hotel and also from his friends and mother. But, nothing deters him from being a moral and to some extent financial support to Shiuli’s grieving mother and siblings. But, can this be called love? I am not sure or rather convinced but confused. Dan seems to be a clueless young man who prefers to go for some wild goose chase. The inevitable end comes; Shiuli’s death. Both her mom and Dan who strive for her revival till then accept it with grace, composure and move with their lives. 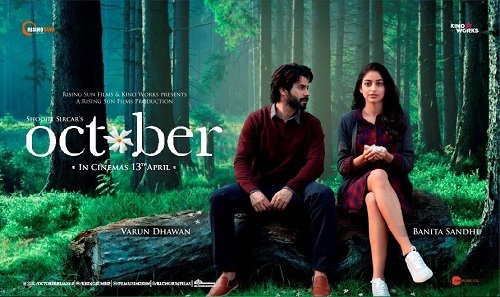 ‘October’ may be a turning point for Varun who had invariably been shown and seen as a singing dancing, funny guy. He proves that he is a director’s actor and can raise to the occasion to give arresting performance. It is superfluous to praise on the technicalities of many of the persent day movies. Ther reviews term the movie as poetic and its subtext of uncertainity of life; but, for me it is, indeed, puzzling and disappointing; I mean both the movie and the rave reviews.